Lisa Scott wants to elect someone who believes in Parks and Rec! There isn’t anyone in Dayton who can rock an Esrati for Congress shirt the way Lisa Scott can. 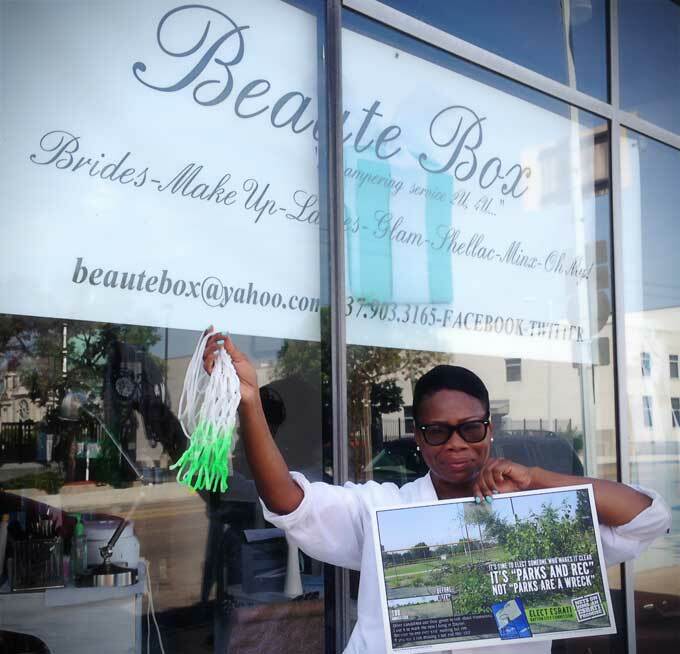 That said, Lisa is the owner of Beaute Box at 116 W. Fifth Street Dayton OH 45402. She does nails, pedis, makeup, massage, makeovers, waxing etc. You can check out her website at www.beauteboxllc.com or call them at 937-903-3165. When Maya turned 13, as part of her birthday party, the entire crew went to Beaute Box for makeovers- and then we did a big “model” shoot in the spa and out back with the exposed brick walls. The girls had a blast- and the pictures were amazing. If you want to get a day of beauty in- Lisa’s your lady. Thanks for supporting the hoops Dayton campaign Lisa- and being a fan and, an amazing cheerleader for me, and for Dayton.